SAN DIEGO The commander and top officers of a San Diego-based Navy frigate have been relieved of duty after a rowdy, booze-fueled port visit to Vladivostok, Russia. Cmdr. 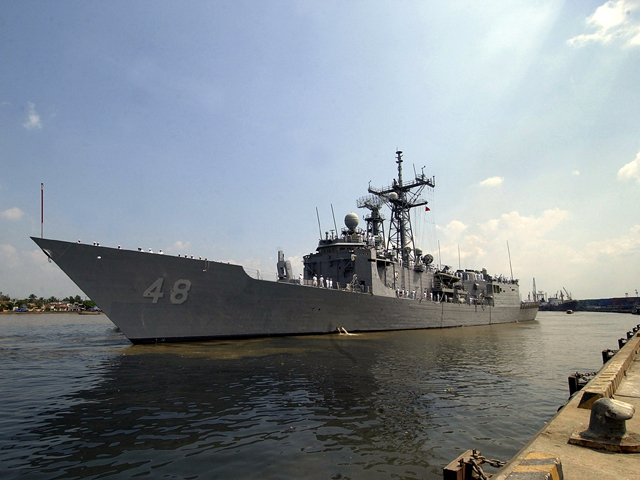 Joseph E. Darlak, skipper of the USS Vandegrift, was removed Friday by Capt. John L. Schultz after an investigation "due to loss of confidence after demonstrating poor leadership and failure to ensure the proper conduct of his wardroom officers" during the three-day September stop, the Navy said in a statement. Executive officer Lt. Cmdr. Ivan A. Jimenez and the ship's chief engineer and operations officer were also relieved "for personal conduct involving use of alcohol and not adhering to established liberty policies," the statement said. The names of the two lower-ranked officers were not released because their positions are not considered public under Navy policy, and Navy officials did not give specifics on the misbehavior of any of the officers. The officers were relieved during a port visit in Guam, and they'll be temporarily reassigned in San Diego pending more possible administrative actions, the Navy Times reported. Darlak's ouster comes just over three months after he assumed command of the Vandegrift. He previously served as executive officer of the destroyer Stethem. Capt. H. Thomas Workman, a deputy commander from the ship's squadron, has taken over the Vandegrift until it returns to San Diego at the end of its seven-month deployment later this month, the statement said, and the Navy emphasizes that the ship remains fully ready for any mission.